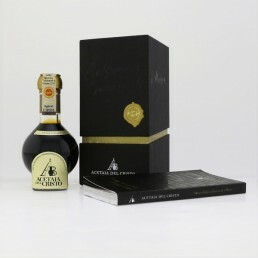 Acetaia del Cristo - The Traditional Balsamic Vinegar of Modena P.D.O. The Traditional Balsamic Vinegar of Modena P.D.O. 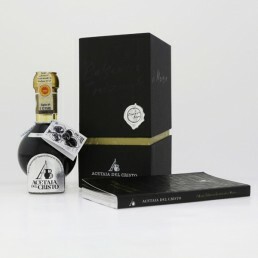 Thanks to ancient techniques that have been consolidated and passed down from generation to generation, Traditional Balsamic Vinegar of Modena (hereinafter TBVM) is the very best expression of the fruits of our land, work and human passion. This precious cruet will enable you to discover one of the most ancient and fascinating traditions of Modena. It is us personally, along with our families, who carry out every single step in full compliance with the most ancient traditions and the PDO (Protected Designation of Origin) regulations: from cultivating our organically farmed grapes, to vintage, must cooking and the delicate drawing, decanting and topping-up operations. At least 12 years of ageing, the first step of a large experience. Main feature of these products is a vivacious energy coming from an inviting acidity enlightened or smoothed by perfectly defined fruity and spicy scents, depending on each specific type of ageing. The Nobleness of a patient wait: the threshold of over 25 years of ageing leads to a real treasure of delicious discoveries. The main feature of the Extra Old category is the strong perception of a total and inextricable harmony of perfumes and aromas; an effect due to the long ageing period and its consequent progressive approach of extreme notes. The mysterious alchemy of centenary woods. Beyond reality the myth begins. This is the first impression given from the tasting of a Fabulous, obtained in absolutely limited editions out of very ancient casks; their balsamic intensity has the power to suspend the consciousness during a while, opening unknown horizons of ecstasy.